About three lbs. 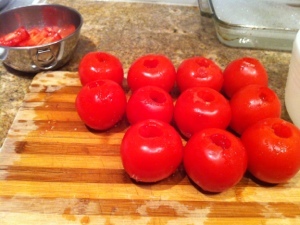 of tomatoes, cleaned, cored and rough chopped. One white onion, same deal (sans coring). About 3-4 stalks of celery (depending on size), with leaves. A few dashes hot sauce, plus some S&P, and a swirl of evoo (I know, the acronym is strangely annoying – I think it has to do what it makes your mouth do). Put it altogether in a large pot/Dutch oven. Give it a good stir, and simmer (lid off) till it’s aromatic and cooked down – about 20-30 minutes. Feel free to use your own styling of fresh herbs . 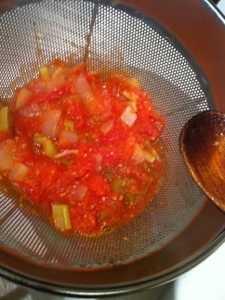 After, push it through a sieve, chinois or your choice of strainer. 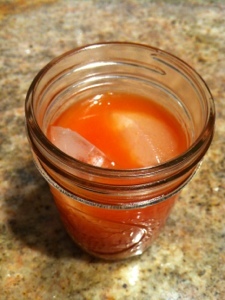 You should have on your hands (or hopefully in the cup) a very delicious tomato juice that will last for about a week in the fridge. Enjoy! I am hoping to remember this yummy and healthy use for tomatoes next August if, like this past year, I have too many to eat but not enough to can.